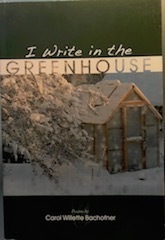 This book is an up close and personal look at the world outside the watery windows of my greenhouse. I love the idea of what happens in the "yard" becoming poems. It was fun to write this collection, to muse upon the natural world and become a bit of a nature flâneur. Rather than digging around in the dirt, I prefer a more observational approach, with pen in hand and words during down like rain. When I sat in my little greenhouse, using my potting bench as a table, I felt the heat and the colors and the scents of yard and garden. My imagination led me to the natural world beyond my perch, to the countryside lane and the shore. Nature and human nature,, lifelong lovers. I strove to put that love on every page. As the poet says in her opening poem: Allow. Allow these poems to move you, get inside and stir you with their attentiveness and wisdom, the freshness of the world they bring directly to us, the possibilities that hide within loss. These poems allow loss and beauty and earth, and they allow us to feel deeply. What a gift! to solstice, sinking near earth. brazenly on and off. Allow loss. their bottles, plastics and cans. of warmth on the back steps. in and out, and in and out. to rise and fall, then rise again.